Four years after their fairly subdued ‘The Shepherd’s Dream’ album, Die Anarchistische Abendunterhaltung, commonly known as DAAU, are finally ready to launch a new recording. ‘Eight Definitions’ is the seventh album by the Antwerp based band in twenty years (at least if we ignore the ‘Richard of York Gave Battle In Vain EP’ and the rarities collection ‘Ghost Tracks’). Recently, the guys also wrote the soundtrack for ‘L’Hiver Dernier’ (2012), a movie by the Belgian-American director John Shank. Since their last record, DAAU’s line-up has gone through some changes again. 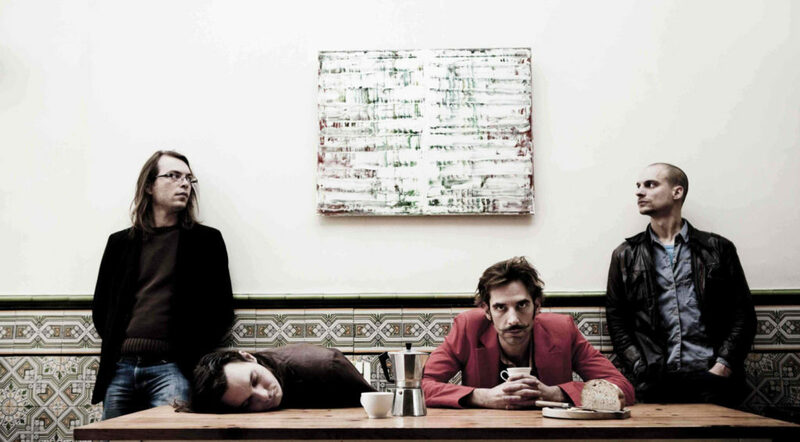 DAAU came about in the early nineties as a part of the fertile Antwerp scene which also generated bands like dEUS and Moondog Junior, later Zita Swoon. Brothers Simon and Buni Lenski (on cello and violin respectively), Han Stubbe (on clarinet) and Roel Van Camp (on accordeon), all classically trained, were still in their teens by then, but with their predominantly acoustic music they immediately stumbled upon a sound of their own. They played their instruments with a punk rock attitude and a gipsy spirit, and from the word go improvisation became essential for their method of composing. Their band name, Die Anarchistische Abendunterhaltung, was taken from ‘Steppenwolf’, a novel by Herman Hesse, first published in 1927. Shortly after their self-released debut album, the four piece was offered an international record deal by Sony Classical. This company would later re-release the first cd in a different packaging and the tongue twisting band name eventually got abbreviated to DAAU. On their second album, ‘We Need New Animals’ (‘97), recorded with the assistance of Michael Brook, the group showed a different face altogether. It introduced hyperkinetic electro beats and the voices of Angélique Willkie (previously of Zap Mama) and An Pierlé.